There could be multiple reasons why SQL Server is consuming lot of physical memory (RAM). 1) Performance of the server could be bad as the queries that are hitting the sever are not optimal. You can further fine tune such queries. 2) Maximum and Minimum server memory configuration is not set up properly. 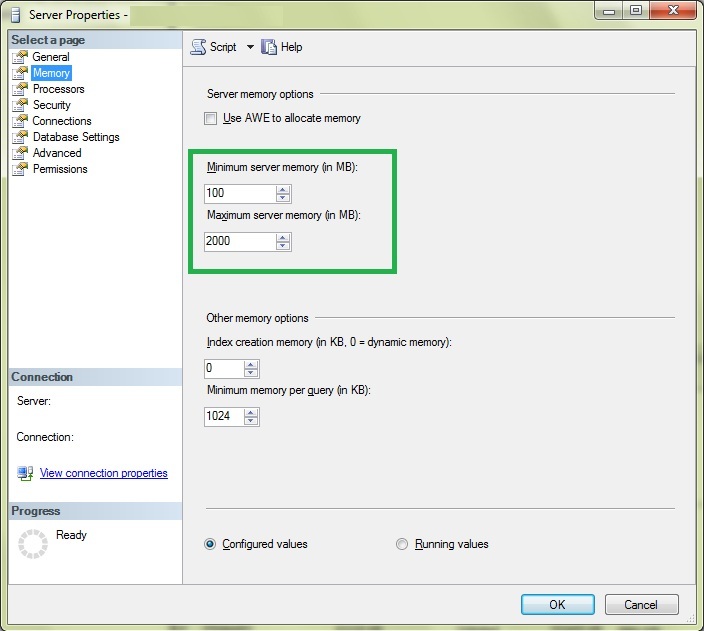 You can set up maximum server memory configuration so that it doesnt eat up whole of the RAM. Now the Server Properties window pops up. In the Server Properties window Select Memory. Adjust these values to opimal memory values as per your SQL Server’s memory requirement. Note: Be aware that changing the memory configuration of SQL Server might give you very bad results. Hence be cautious before making such changes. You might also get There is insufficient system memory in resource pool ‘default’ to run this query error if memory configuration is bad.